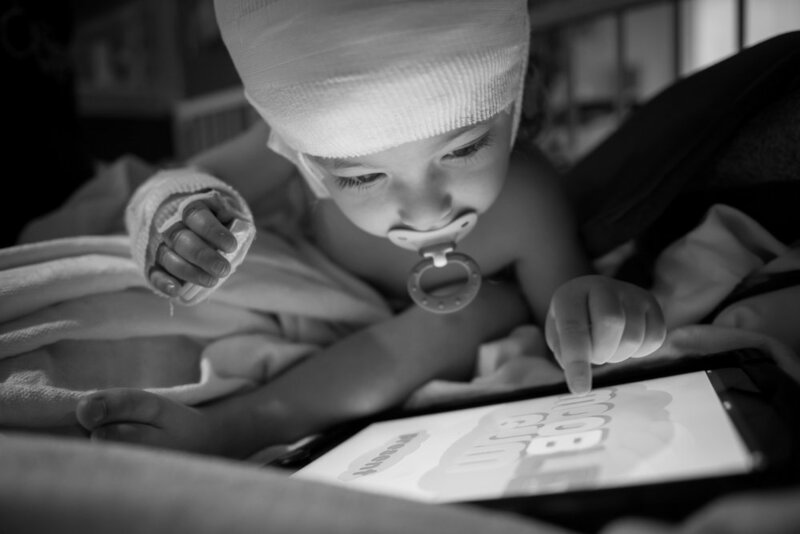 In her hospital bed, Arianna passes time by playing with her iPad. During her observation visits, Arianna stays in her hospital room without leaving for days at a time. Arianna suffers from Tuberous Sclerosis, a rare genetic disease that causes benign tumors to grow in her brain, heart, and kidneys. Arianna is wheeled through the Upstate Golisano Children's Hospital while recovering from her most recent brain surgery. 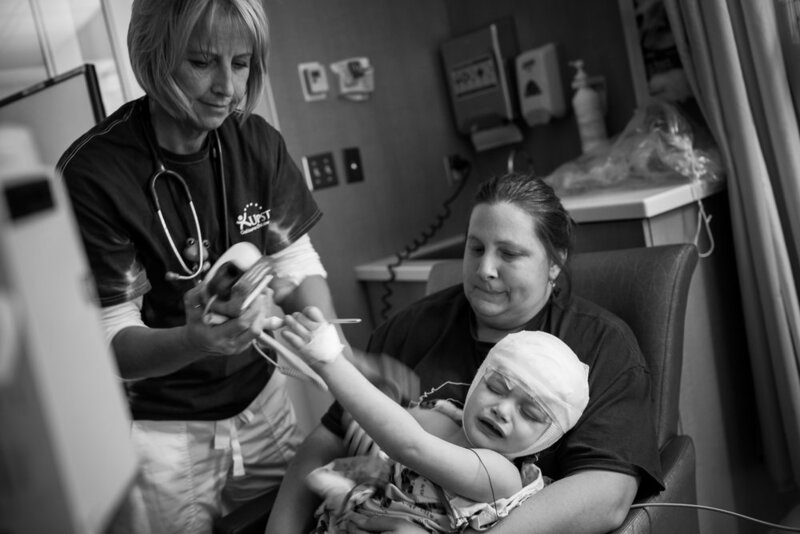 At three years old, Arianna has gone through three brain surgeries in the past year and a half. A doctor removes Arianna's IV as she cries in her mother's arms and her grandmother attempts to comfort her. Arianna's parents worry about her doctors not being aggressive enough, and have considered alternative treatment options. 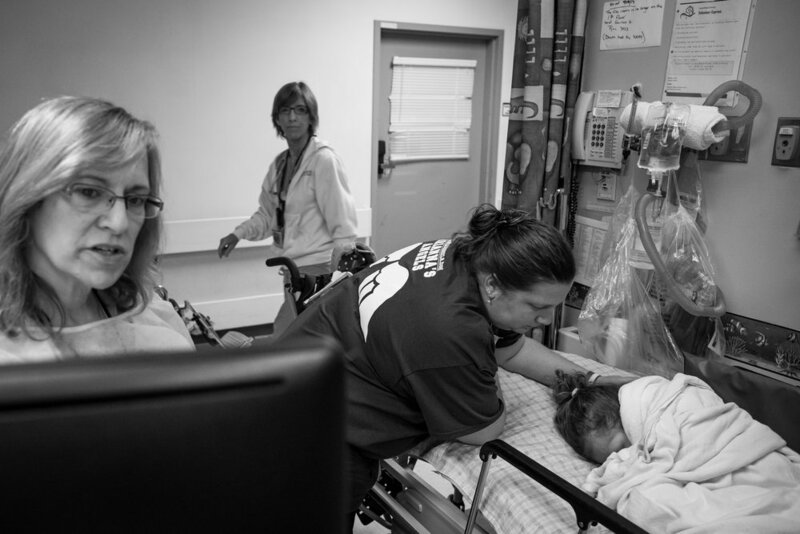 Jennifer Failla, Arianna's mother, comforts her as she wakes up from an anesthetic. Arianna was given an MRI to prepare for brain surgery, which was scheduled for a few weeks later. Three-year-old Arianna Failla whimpers in her mother's arms after waking up from an anesthesic that was given to her prior to an MRI at Upstate Golisano Children's Hospital in Syracuse, N.Y.
en pushes Arianna down an empty hallway while waiting for her doctor to arrive. "A lot of people say, 'how do you do it?'" said Jennifer. "I have no choice. To me, it's my daughter. I want what's best for her." Arianna curls up with her iPad on the floor beside Jen in their family's Central New York home. Jen gives constant attention to Arianna while she still performs the duties of a stay at home mom. A family friend carries Arianna during a benefit held to raise money for a service dog for Arianna. Her family depends on state health insurance to pay for her treatment and rehabilitation, but it doesn't cover everything that they hope to give her to support her growth and development. Sal Failla, Arianna's father, carries her onto the Syracuse Chiefs baseball field to be introduced to the crowd by the general manager. Three year old Arianna Failla clenches her body together as she seizes on the floor of her hospital room in the Upstate Golisano Children's Hospital in Syracuse, N.Y.
Arianna watches her music therapist play a song while at the hospital for an observational visit. Arianna pushes away a nurse while recovering from brain surgery at Upstate Golisano Children's Hospital. During her most recent procedure, doctors removed three tubers from her brain. Arianna has a seizure in her high chair at the Upstate Golisano Children's Hospital during one of her observation visits. Doctors monitor her brain functions for days at a time in order to better understand her seizures, which are associated with her condition.